Content: The five sections are Basic Food Safety, Personal Hygiene, Cross-contamination and Allergens, Time and Temperature, and Cleaning and Sanitation. You must complete these sections before the assessment is available. There is an optional "Job Specific" section that your manager may want you to complete. Please ask your manager before taking the assessment. Beginning the Course: After purchasing the course or having it assigned to your ServSafe User Id, you can simply select Launch from the Course Management page. If a Course Key was assigned to you, simply enter that key on the same page in the designated area. Using the Course: Use our System Check (link to the system check) to ensure your computer is compatible with the Course. 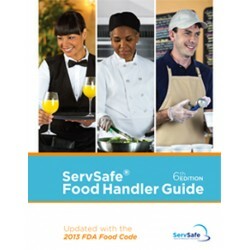 Servsafe Food Handler (Employee) There is 1 product.